If Ford had a mantra for it’s current commercial range it could very well be ‘ if it ain’t broke, don’t fix it.’ Having upgraded the Transit Custom earlier this year, it has recently followed this up with the introduction of the new improved Transit Connect light van, which Company Car & Van got it’s hands on recently. 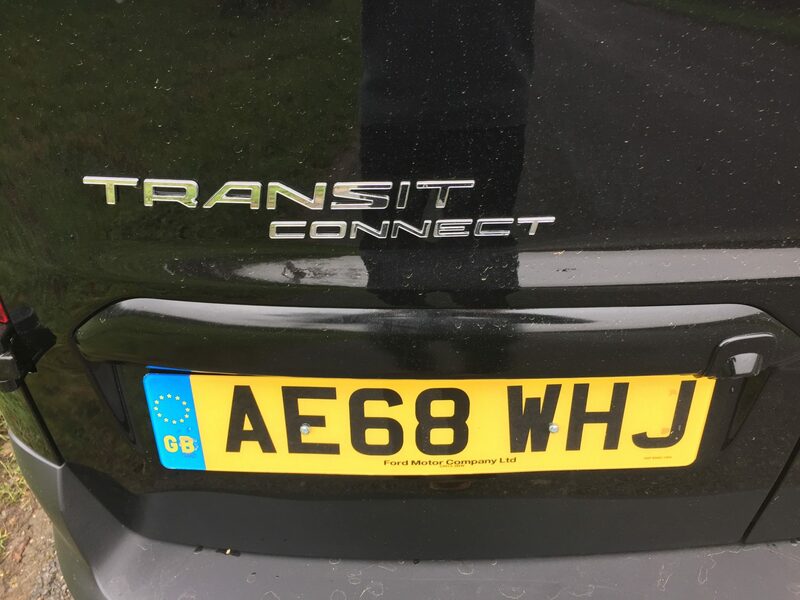 Improving a van that won the International Van of the Year award back in 2014, might be daunting for some, but Ford have made a number of improvements which bring new Transit Connect right up to date. The latest Connect introduces a new front-end that adopts the latest Ford design DNA, featuring three-bar Transit grille combined with slimmer headlamps with a more aerodynamic lower fascia & front spoiler. Inside, the cabin features a revised instrument panel with a new central control area that incorporates a floating, tablet-inspired 6″ colour touchscreen on high series models. This features Ford’s SYNC 3 communications & entertainment system. New trim materials have also been introduced. litre EcoBlue engine can also be specified with an advanced new eight-speed automatic transmission. To minimise overall cost of ownership, service intervals have been extended on both diesel & petrol variants, with manual diesel vehicles now offering variable intervals of up to 2 years/40,000 km (25,000 miles). The new Connect introduces a range of segment-first driver assistance features, including Intelligent Speed Limiter, Pre-Collision Assist with Pedestrian Detection emergency braking system, Side Wind Stabilisation & Active Park Assist, which will hopefully help your drivers not to reverse your van into a wall ! New Connect is available in single, double cab & combi bodystyles with short-wheelbase (L1) & long-wheelbase (L2) versions. It’s spacious & offers load volumes of up to 3.6m3 with a full bulkhead & a payload capacity ranging from 520-890 kg. Spec wise, customers can choose from entry level Base, Base HP, Trend, Trend HP & the range topping Limited & Sport models. My test model was the L2 Limited fitted with the 1.5 EcoBlue 120PS engine, with six-speed manual gearbox. From the outside, the new Connect, looks more attractive, with nicely rounded edges both at the front & the rear. Inside, the Limited’s dash board is well, just like one you’d find a in a Ford car. The buttons & knobs are nicely finished & the dash layout is easy to navigate with a pleasing driving position, thanks to the multi adjustable 8 way drivers seat. All models get a reach & rake adjustable steering wheel. Limited is a new addition to the range & features power folded heated mirrors, rear parking sensors, heated driver & passenger seats, cruise control with adjustable speed limiter, auto wipers & headlamps, a quick clear heated windscreen, a perimeter alarm & keyless start. Convenience wise, Limited comes with DAB, USB, Bluetooth, steering wheel mounted audio controls, load compartment lights, six DIN cargo tie downs, dual fold flat passenger seat with storage box & a full steel bulkhead. Options fitted to my test model included metallic paint £300, Fords DAB SatNav system, £780, a wireless charging pad £95 & a blind spot information system £350. Cabin storage includes a full width overhead shelf, a lockable glove box, twin cup holders & deep door pockets. Limited comes with a very useful load-through hatch in the bulkhead which enables in the larger L2, a load length up to 3.4m to be carried. 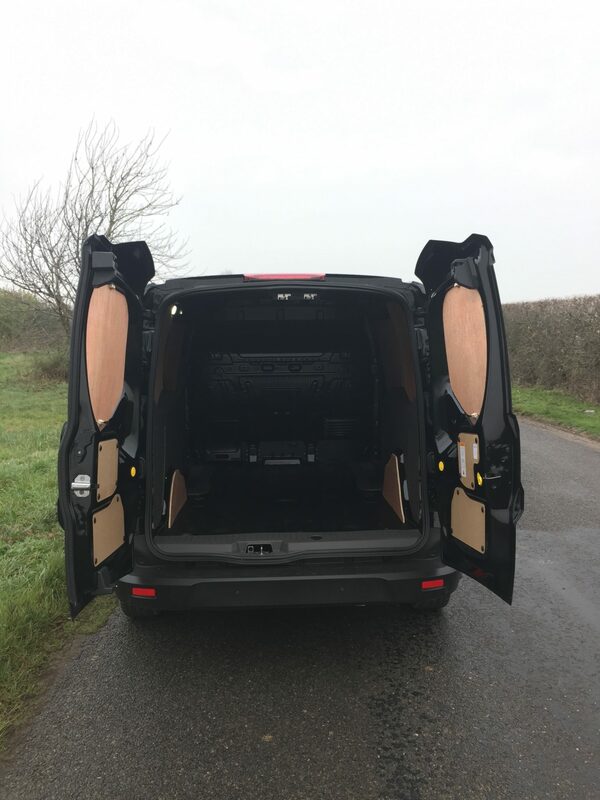 The rear load space is up to 3.2m3 with the full bulkhead, increasing to 4.4m3 including the front load space & a payload of 675kg. Emissions on my test van were 130g/km, with a claimed combined mpg of 56.5 in my EcoBlue diesel model. Some European cities already have a diesel ban in place at certain times of the day & by offering a Connect fitted with Ford’s 1.0 litre petrol EcoBoost, Ford are covering all bases. What’s it like to drive ? Pleasantly car-like. 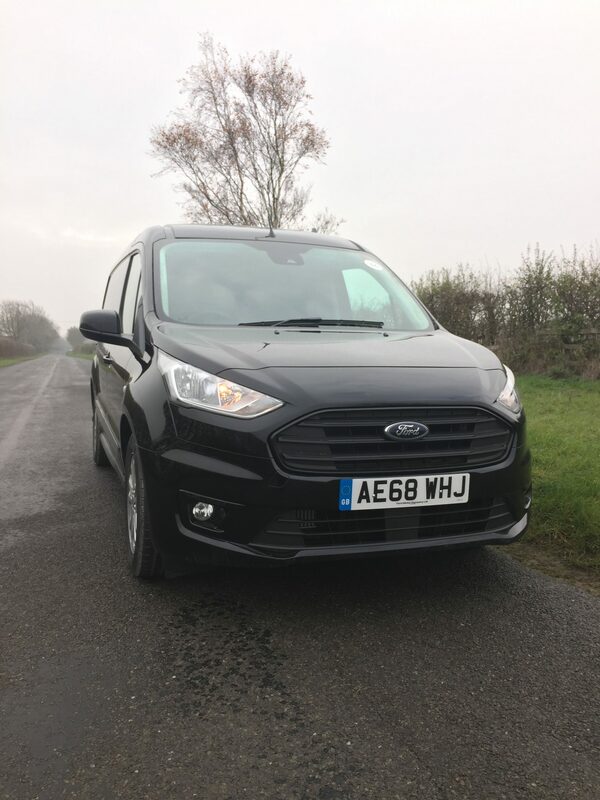 What Ford have managed to achieve with the Custom & now the Connect is a cabin which matches in some cases the interior of a small car. Steering is light & precise, it handles both winding country roads & the motorway trawl with aplomb & I would definitely take the 120PS version if you want to make decent progress. I’m sure the 75PS model will do a job for you, but it will struggle with a full compliment of load & two passengers, especially on the motorway. I had no such problems though. At motorway speeds, the full bulkhead keeps road noise down, enough to listen clearly to your favourite radio station or answer your phone using the simple steering wheel & dash board Bluetooth controls. A van with cruise control may seem too much for some, but if like me, you have to do a lot of motorway travel, there are so many 50mph speed limited road works currently on all English Motorways as the Smart Motorway System is introduced, that setting the cruise to 50 mph allows you to relax, with no fear of exceeding the limit & an unwanted 3 points. 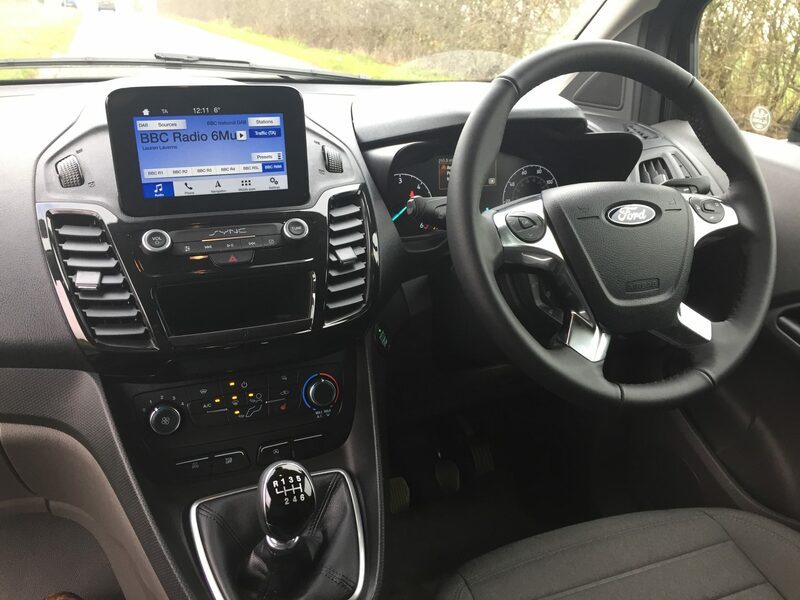 All small businesses need to stay connected & the 6″ colour touchscreen featuring Ford’s SYNC 3 communications & entertainment system, works seamlessly. Before I set off, I set up my i-Phone & connected to the Bluetooth hands-free phone system, which enabled me too make & receive calls whilst keeping my eyes firmly on the road. The number of white van drivers I see daily using their mobile, one hand on the steering wheel as they take a corner, is frankly ridiculous, so my advice to ANY company is to invest in a van or vans with Bluetooth capability. It’s a no brainer for your company & for your drivers.